As the temperatures continue to climb here in Arizona I find myself daydreaming more and more about ice cream. I simply can’t imagine what my summer would be like without this cool and refreshing indulgence, that practically hugs my taste buds from the very first lick. I love ice cream treats of all types including the infamous ice cream sandwich. The amount of creativity this disc shaped dessert offers is astounding to me. In honor of National Ice Cream Day I’ve partnered with Nielsen Massey vanilla to create a fun ice cream sandwich of my own using their Tahitian vanilla. Made from Tahitian vanilla beans it has rich floral & fruity features with a cherry-like flavor. Due to the fact that it's very susceptible to heat the Tahitian vanilla is perfect for cold dishes, desserts, frozen desserts, smoothies and pastry creams. Back to the ice cream sandwich; this time honored treat takes on a new look with cinnamon apple swirl ice cream sandwiched between two homemade oatmeal raisin cookies. This was a huge hit at our house and I'm positive it will be at yours too. Pour 1 cup of the cream into a medium saucepan and add the sugar. Scrape the seeds from the vanilla pod into the saucepan and add the pod to the pot. Warm over medium heat, stirring, until the sugar is dissolved. Remove from heat and add the remaining cream, and the vanilla extract. Chill mixture thoroughly in the refrigerator, for at least eight hours or overnight. When ready to churn, remove the vanilla pod and freeze in your ice-cream maker according to the manufacturer’s instructions. About 20-25 mins. About three to five minutes before the ice cream is ready, or when the ice cream looks like it is mostly set up, carefully pour in the cinnamon-apple mixture, and continue churning. Melt the butter in a skillet over medium heat. Toss the apples with the cinnamon and add to the skillet. Cook, stirring often, until the apples are tender, about 2-3 mins. Remove from the heat and let cool. Cover and refrigerate until ready to use. Preheat your oven to 350 degrees F. Line baking sheets with parchment paper. In the bowl of your electric mixer, beat the butter until smooth. Then add the sugars and beat until creamy and smooth (about 2 - 3 minutes). Scrape down the sides of your bowl as needed. Add one eggs one at a time until and beat until incorporated. Add vanilla extract. In a separate bowl, whisk together the flour, baking soda, salt, and ground cinnamon. Add this mixture to the batter and beat until incorporated. Stir in the rolled oats and raisins. Drop by the tablespoon full onto prepared sheets. Flatten the cookies slightly until they are about 1/2 inch thick. Bake the cookies for about 14 -16 minutes. Remove from oven and let the cookies cool a few minutes on the baking sheet before transferring them to a wire rack to finish cooling. Cinnamon Apple Swirl? I'm in! Hubba hubba! That looks perfect! My favorite flavor ice cream is coffee!!! What a delectable recipe!!! I have an ice cream maker and want to make this! Vanilla is my favorite flavor. This looks super yummy and easy to make!!! Lots of good going on in these recipes! HOLY YUM for above!!!!!!!!!!!!!!!!!!!!!!!!!!!! My fave ice cream although I can't eat anymore was always mocha chip - I grew up back east! :) Coffee now but I can only take a little taste. Homemade ice cream sandwiches rock! That sounds absolutely delicious! I must try this! Oh my goodness, this ice cream sandwich! This is amazing! yum these look divine... what a great idea to use oatmeal cookies as the sandwich base. thanks for the great read and ideas. Ice cream sandwiches are always a winner! These look SOOOOOOO good, though. Cinnamon and apple swirl? yes please. 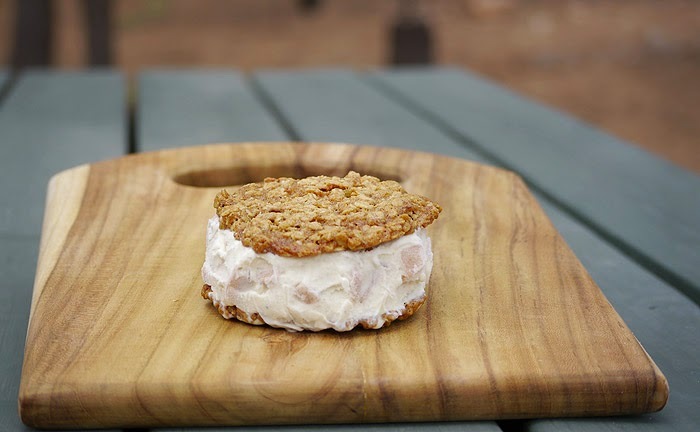 What a delicious ice cream flavor that you've classically paired it with an oatmeal cookie! Bravo! OH goodness! I want that NOW! Oh, wow-- this looks SO good! There's an ice cream shop near us that makes like 8 different kinds of vanillas with beans from around the world. You can get a sampler - it's amazing how different they each taste! I bet this is amazing - I'm a big fan of the NM vanilla. Oh man these sandwiches look awesome! Cinnamon apple ice cream sounds fantastic! I like blackberry and World Class Chocolate. My all time favorite ice cream flavor is butter pecan. My favorite ice cream flavor is butter brickle.